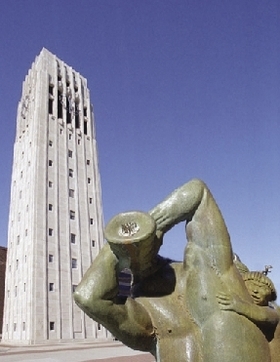 Burton Tower is the centerpiece of the central campus of the University of Michigan. Since its founding in 1817, the University of Michigan has attained a global reputation as an academic and research powerhouse, attracting some of the world’s brightest students and top faculty. Its ranking among other universities, however, has dropped sharply in recent years, and the school has seen top faculty lured away by more generous offers from private universities. Were U of M to go private, taxpayers would save that $320 million per year, plus millions in construction costs. Capital outlay expenditures by the state for the Ann Arbor campus have totaled $160 million since 1993. Converting the university to private status would place Michigan on the forefront of what appears to be a developing trend. 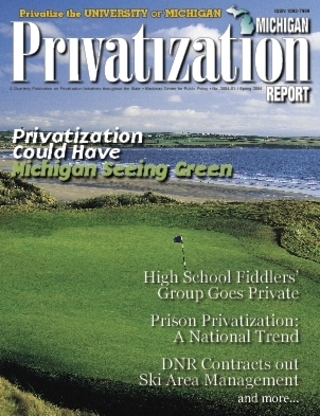 In December 2003, South Carolina gave all 13 of its universities permission to go private; Colorado’s university system is preparing a contingency plan to convert all four of its universities to private status in 2009; and the trustees of Michigan’s own Lake Superior State University have discussed the idea. Though it would require a change in Michigan’s Constitution, privatization would liberate U of M from many of its political hassles with Lansing. State-sponsored universities are coping with deep cuts in state subsidies and find it difficult to plan not knowing what state governments are going to do. During 2003, the Granholm administration cut state university general operations support by $193 million. At the same time, private universities have been poaching professorial talent from the best public universities. In the past decade, New York University alone has spent close to $1 billion to attract star faculty from other institutions and establish prestigious research institutes. Both of these reasons may be contributing to U of M’s recent decline in rankings among other universities and colleges. In 1987, U of M was ranked the No. 8 national university by US News & World Report, ahead of such schools as Columbia and the Massachusetts Institute of Technology. In 2003, and in the same category, U of M ranks No. 25. A privatized University of Michigan would almost certainly raise its tuition rates to help compensate for the loss of state revenue, as well it should. It is not unfair to ask those who benefit directly from earning the highly valued U of M degree to bear a greater burden to pay for it, especially considering the financial background of most of the school’s students. A 2003 Detroit Free Press story reported that over 51 percent of the University of Michigan’s freshman class comes from households with incomes above $100,000 per year. Yet, only 12.7 percent of Michigan households earn such incomes, according to calculations using 2000 Census figures. Tuition hikes could actually help those students who truly need help — by enabling the school to offer greater outright gift aid and tuition reductions to students from low-income families, as is often the practice at private universities. Needy students at public institutions currently rely more on loans and work study programs. A private U of M could also strengthen its financial outlook by selling its hospital— hospital assets alone are valued at more than $600 million — and adding that revenue to its $3.5 billion endowment. Further, campus institutions such as the Nursing and Kinesiology schools could continue to be taxpayer supported, under contract with a privatized U of M. Cuts in state support are pushing public universities toward more private models of operation whether they like it or not. It would show rare leadership and practical savvy if Michigan lawmakers were to come up with a plan for making the University of Michigan a private institution, for the benefit of students, professors, and taxpayers alike. Lance J. Weislak, a University of Michigan graduate and MBA candidate at the University of Chicago, is an adjunct scholar with the Mackinac Center for Public Policy; Michael LaFaive is director of fiscal policy at the Mackinac Center.